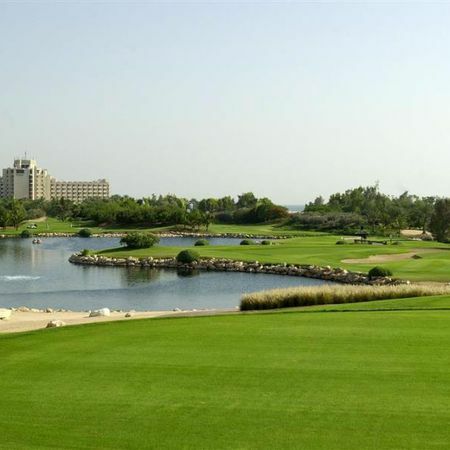 Opened in December 2016, the Jumeirah Al Naseem is the fourth luxury hotel of the Jumeirah Madinat Resort. 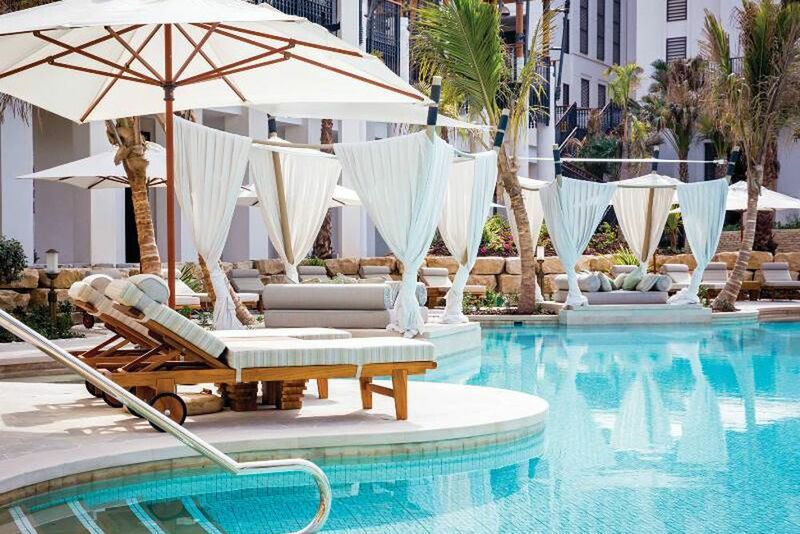 The adults-only pool promises plenty of rest and relaxation. You will experience the perfect combination of Arabic architecture and modern design. Experience the inevitable feel-good atmosphere here! 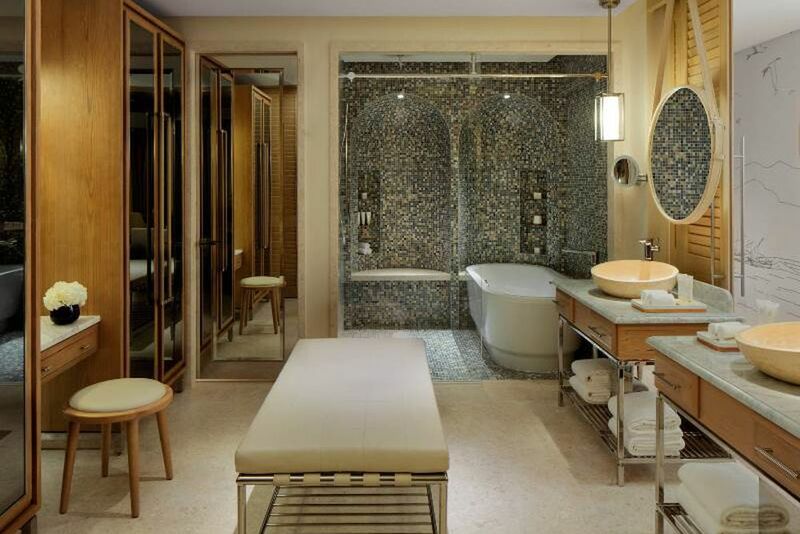 The luxurious Arabic style bath leaves nothing to be desired. Fancy Mediterranean seafood specialties? Then Rockfish is the right place for you! The Al Mandhar Lounge serves French-Moroccan delicacies. 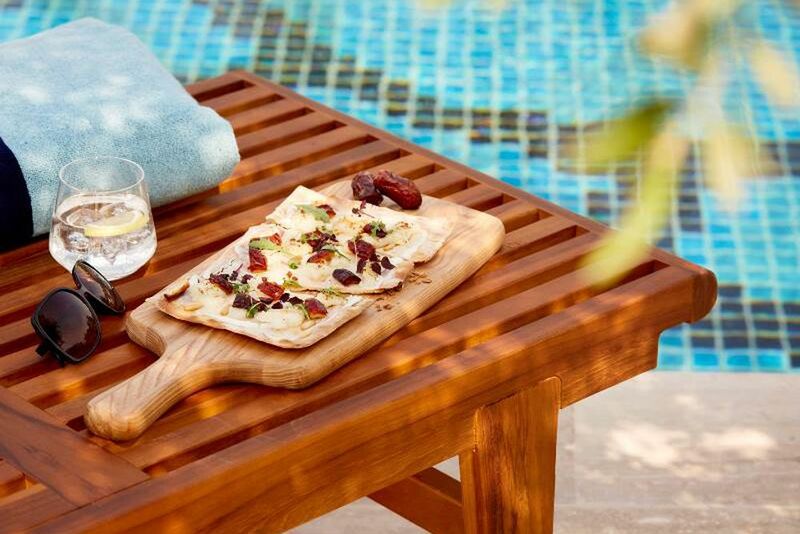 Treat yourself with a healthy snack from the Kalsa Pool Bar. 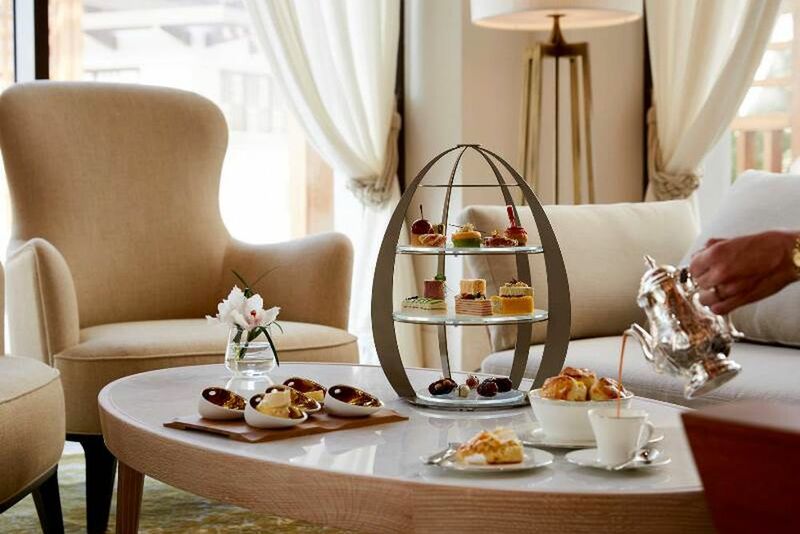 Enjoy relaxing moments with fantastic views of the Burj Al Arab. Pure relaxation! Let your soul forget about reality and discover tranquility. The spacious pool area nestles perfectly into its environment. 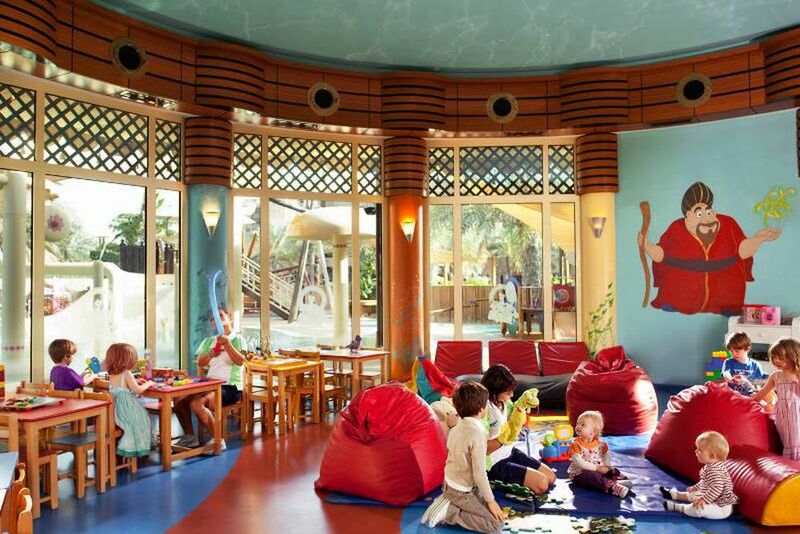 At the Sinbad Kids Club, the younger guests will be taken care of by professional babysitters. How could you start the day better than with a morning yoga class? The Talise Spa has a plunge pool, several relaxation areas, a steam room and a sauna. Of course, the professional team spoils you with soothing treatments on the beach. 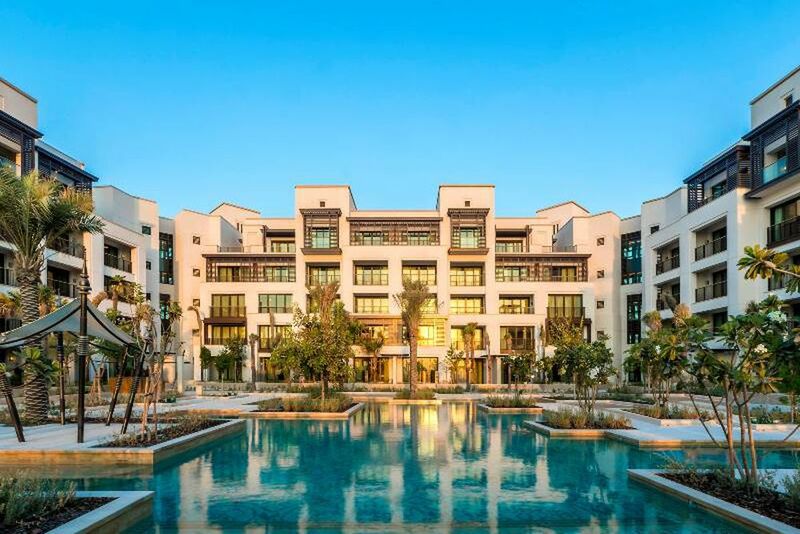 Anchored on a stunning endless stretch of coast sits Jumeirah Al Naseem, bringing a new wave of energy, exuberance and excitement to Madinat Jumeirah Resort. A breath of fresh air in today’s dynamic Dubai is now open. Dubai International Airport is approximately 25 kilometers away. 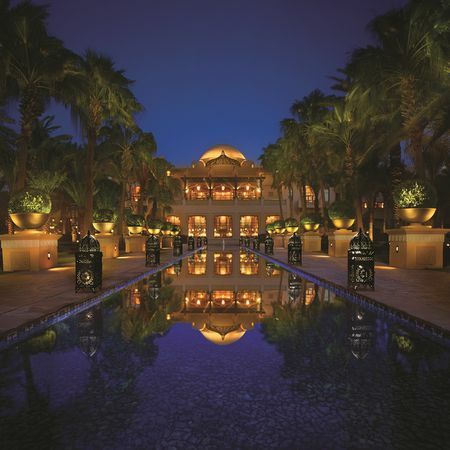 Jumeirah Al Naseem is the youngest member of the successful Arabian Resort's family of hotels and has been crafted amongst the inland waterways, bustling Souk Madinat Jumeirah, award-winning Madinat Conference Centre and indulgent Talise Spa. 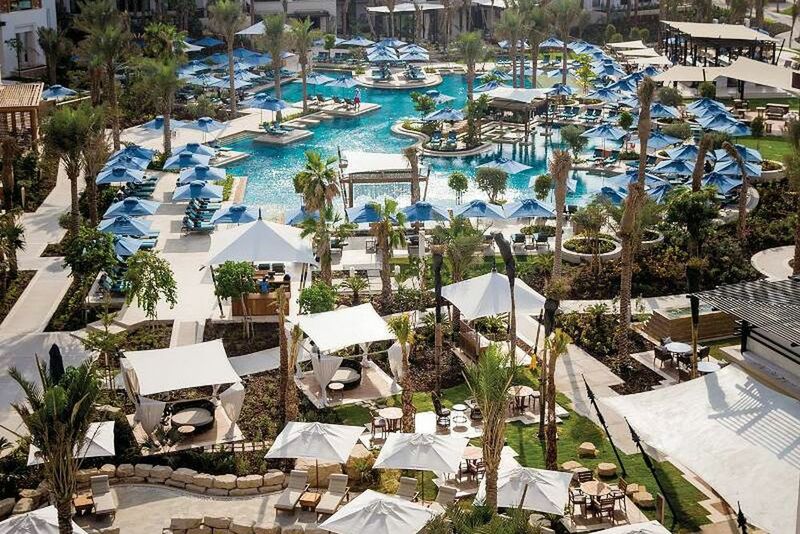 Jumeirah Al Naseem features 10 restaurants and bars under the common theme of The Arabian Explorer. 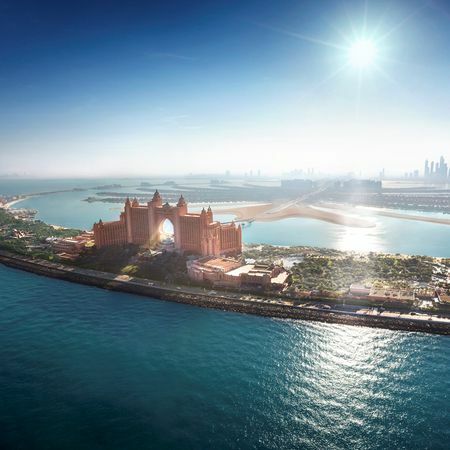 There are also over 40 other Madinat Jumeirah Resort restaurants at the Jumeirah sister hotels. Also in the adjacent Souk Madinat Jumeirah, you will find 50 restaurants and bars and great shopping. The Sugarmash is next to the adult pool and offers except tasty delights of Polynesian and Caribbean cuisine, exotic drinks, and fruity cocktails. The Palmery offers healthy cuisine in buffet and à la carte form, and the Rockfish serves exquisite Mediterranean seafood. The Al Mandhar Lounge specializes in Franco-Moroccan delights and tea, and the Kalsa Pool Bar serves healthy snacks such as delicious flatbreads, Sicilian pizza fritta, fresh grape dishes and salads. An absolute highlight is the Ambaron roof terrace. 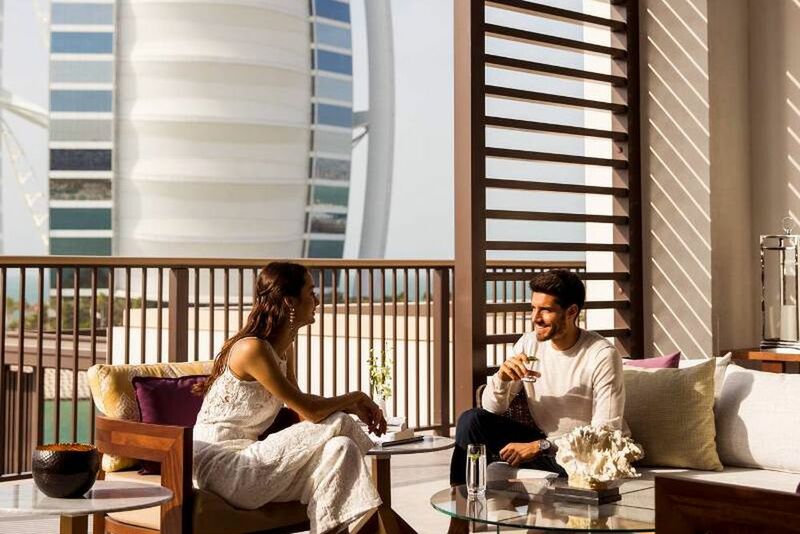 Here, you can enjoy the fantastic view over the gardens of the hotel and the Persian Gulf with an excellent aperitif or a fruity cocktail. The Summer Salt Beach Club is located at the beach area near the bridge of the Burj Al Arab and is open during the day exclusively for guests of the suites. Lots of fun and relaxation as well as exquisite international cuisine can be enjoyed here. Relax on the two-kilometer-long private beach, or spend a relaxing afternoon at one of the five pools. Guests can visit the turtle lagoon, part of Jumeirah turtle Rehabilitation Project, have fun in the Kids Club, relax in the adults-only pool and venture to nearby Wild Wadi Waterpark. You can also visit the Madinat Theater, which features great musicals and captivating live shows. The 387 rooms and 43 suites are spacious and open plan, accented with Arabian touches delivering a strong sense of place. 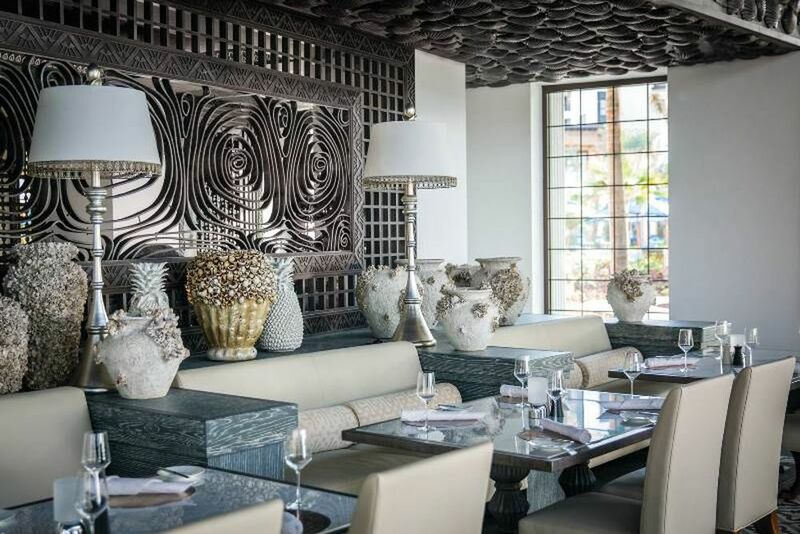 The contemporary interior design is inspired by sand dunes, blue skies, sea breeze and Dubai's heritage of pearl diving and Bedouin traditions. From the balconies and extended terraces, there are spectacular views of the sea, the resort's landscaped gardens and swimming pools and Burj Al Arab Jumeirah. Bathrooms are generous in size and feature Arabic features and walk in showers. Amenities include panoramic windows, LCD TV, DVD player, safe, minibar, tea/coffee making facilities, and complimentary newspapers. Resort Deluxe - ca. 51 m², Overlooking the lush garden landscape and pools, these rooms have a large double bed. Maximum 2 adults and 2 children under 12 years. Ocean Deluxe Room - ca. 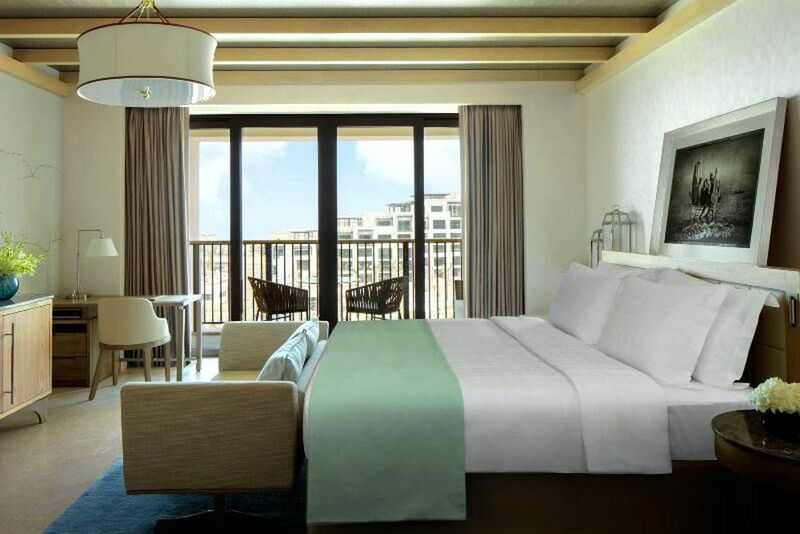 51 m², Boasting incredible sea views, these rooms feature the same amenities as the Resort Deluxe rooms. For a maximum of 2 adults and 2 children under 12 years. Resort Superior - ca. 60 m², Overlooking the verdant gardens, these rooms have a double bed and a sofa bed which can be separated by a sliding door. Maximum 2 adults and 2 children under 12 years. Family Suite - ca. 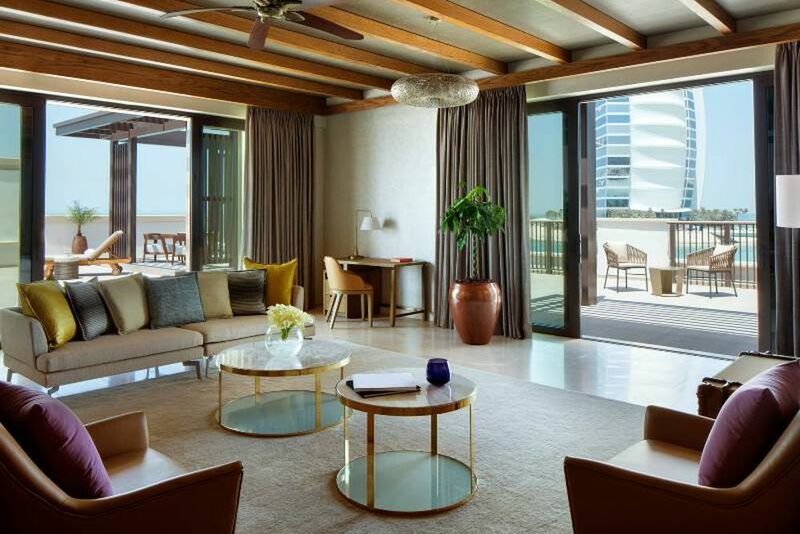 126 m², Overlooking the resort and Persian Gulf, these suites offer two bedrooms and two bathrooms. Guests in these rooms benefit from the Family Club Lounge benefits: exclusive check-in desk, private lounge area, game room and computer room. In addition, you have exclusive access to Summersalt Beach Club. Maximum 2 adults and 2 children under 16 years. 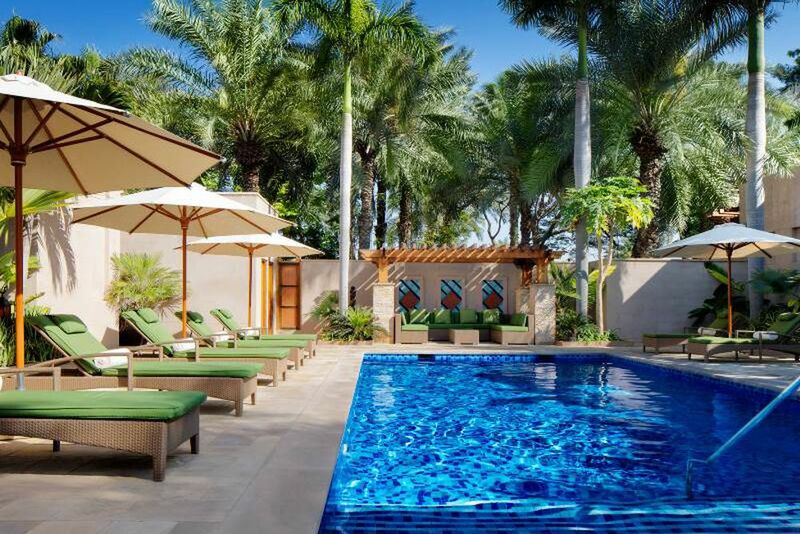 The elegant Talise Spa is an oasis of relaxation. Here you can relax and forget your everyday stress. With the soothing treatments that are completely tailored to your needs, you bring your body and mind back in harmony. There are 26 treatment rooms (including two couple’s suites), an infrared sauna, a steam room, and an indoor pool. There are several relaxation areas, a plunge pool and yoga classes to complete the concept perfectly. Guests of the luxurious resort enjoy free entrance to the Wild Wadi Water Park , where you can have fun on 30 slides and other great attractions for the young and old! Stay active even whilst on holiday at the professionally equipped Talise Fitness Center.